B2B technology buyers turn to their peers – your customers – as a primary source of input in their buying decisions. Surveys have shown that customer reviews influence purchasing decisions more than Industry Analyst Reports. In this session, you will learn as an AR professional what should you know about the growing trend of peer review sites and how to respond. 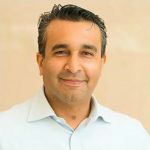 TrustRadius CEO Vinay Bhagat will present original research into B2B technology buyer influences, and share how leading technology companies like Oracle, IBM, SAP and Cisco are adapting.